On Saturday night, Kitchens of the Great Midwest author J. Ryan Stradal entertained a large audience at the conclusion of One Book, One Mesa County. A native Midwesterner, J. Ryan discussed his upbringing, touching on his early love of books and reading, as well as things he ate and enjoyed (or didn’t.) He shared an endearing anecdote of his mother returning to college as an adult, and as a time saver, her reading homework assignments to her young boys at bed time, such as the Canterbury Tales. He was so proud of her being published in her college’s literary journal that he brought it to school for show-and-tell. He knew all along that he had a novel in him. His educational and work background is in television and radio production, and J. Ryan has recently been a story editor/producer on shows such as Deadliest Catch, Ice Road Truckers, and Storage Wars. When he became able to write full time, he wrote Kitchens in just under a year. It was picked up only a few weeks later. He credited writing classes, writing groups, and copy editors as big supporters to his process and success, as well as his experience editing for television. 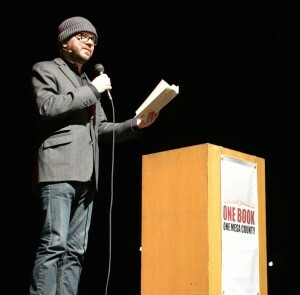 Thank you to all of our One Book participants, readers, and audience members who made this year a success. This was the 12th and final One Book, One Mesa County Program. Mesa County Libraries wish to thank current and past One Book Committee members for their service and expertise, the sponsors whose support of One Book has been invaluable, and especially everyone in the community who has participated in One Book in any capacity through the years. We hope One Book has been as enlightening, interesting, and fun for everyone else as it has been for our Committee and Mesa County Libraries. Thank you.